On August 23, 2008, I opened an Etsy store. I thought it would be a great way to sell my handcrafted bath and body goodies. Two weeks later, on September 7, I received my first order! The response to my products was encouraging, so I soon opened my own online store, too. By May of 2009, I had achieved certification through Green America and Leaping Bunny. Then I began to pick up some wholesale customers through word of mouth. My company continued to grow and evolve, and now it is four years later! As Herban Lifestyle’s 4th Anniversary approached, I felt it was time to write down my guiding principles – the framework of values and guidelines I have given myself to work within as I have grown my business. I solicited feedback on a draft of these principles from friends and family members who have been there from the beginning. The result was Herban Lifestyle’s Eleven Virtues, pictured above. 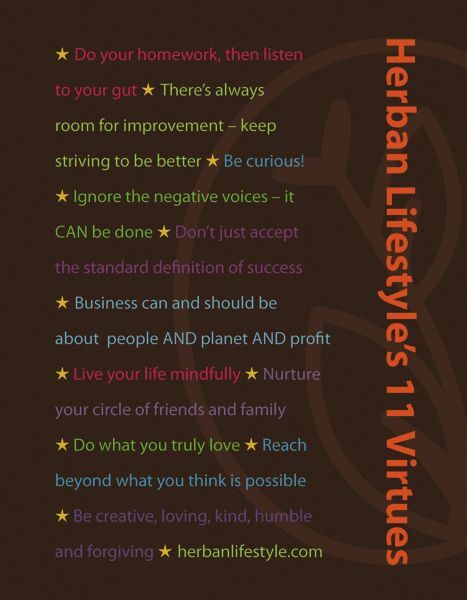 If you like the image, I have included a link to a free 11″ x 17″ PDF version of the Herban Lifestyle Eleven Virtues. Feel free to download and print it out. A huge thank you to all who have supported Herban Lifestyle, in oh so many ways, over the years! This entry was posted in herban lifestyle and tagged 4th anniversary, annivesary, eleven virtues, herban lifestyle by YourStellarSelf. Bookmark the permalink. Thank you very much! That’s so sweet! Where’s the love button? Congratulations. I think I’ve been with you on about 2.5 years of that journey and love what you are doing. Aw, thank you for your kind words and continuing support, Tammy!